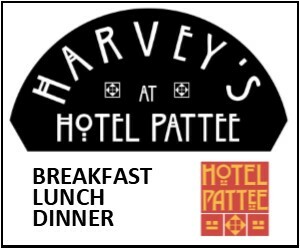 Two hours of lectures and discussions were followed by a supper catered by Saddles BBQ Bistro in Madrid. 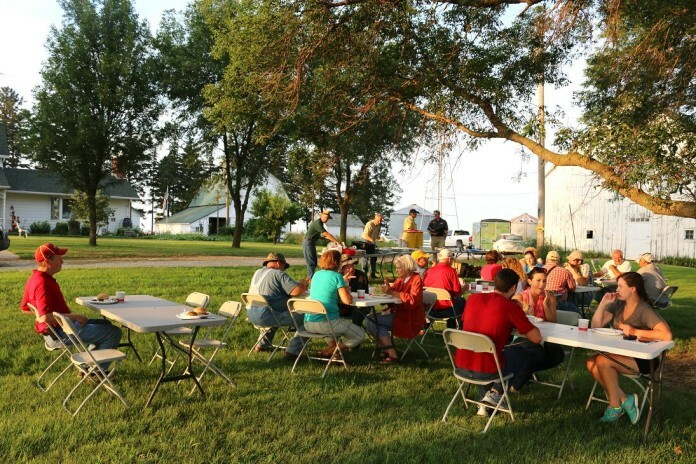 Craig and Deb Fleishman of rural Minburn welcomed visitors to their farm Wednesday afternoon for an Iowa Learning Farms field day. 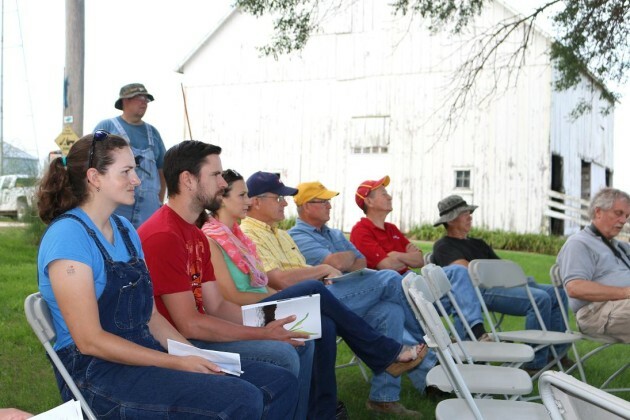 About 25 people attended the educational event and learned about ways to reduce soil erosion and nutrient loss by integrating various farming practices. 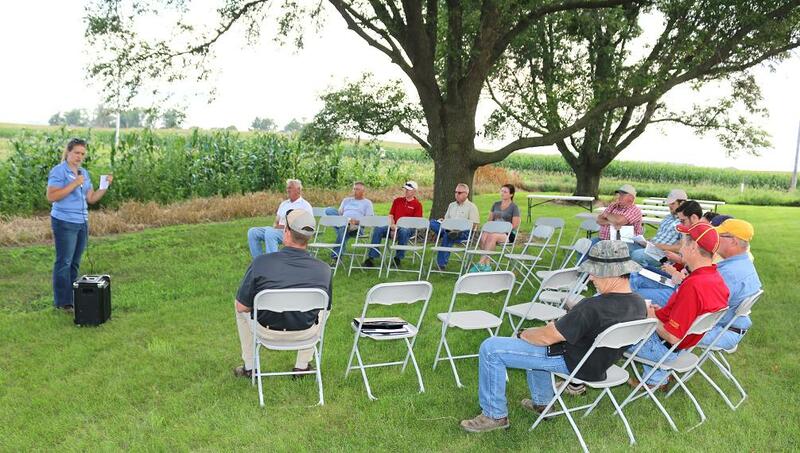 Craig Fleishman, an Iowa Learning Farms farmer partner, explained his method of three-year crop rotation. As the inheritor of a Century farm, Fleishman said he is mindful of the changes he is making at his “home place” and aims to do his part to help with the Iowa Nutrient Reduction Strategy. “It’s up to me to carry on the tradition here and to improve the farm,” he said. 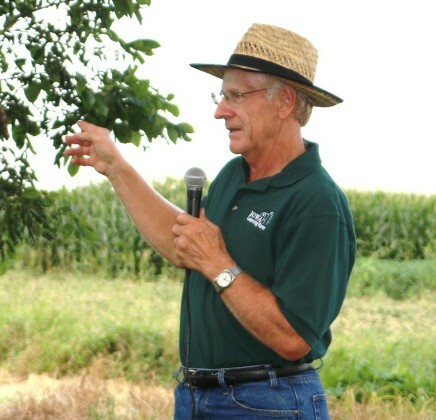 He said he started experimenting with low-input sustainable agriculture (LISA) in 1985. Part of the field day included visiting a field inter-cropped with corn, soybeans and oats and another field recently planted with a mixture of cover crops. Fleishman said he looks at the whole farm and asks what he can do to improve soil health and water quality while remaining profitable. 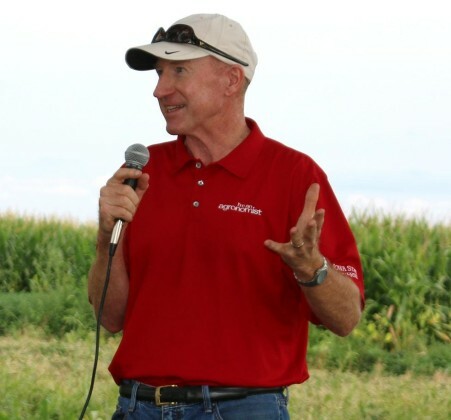 He compared his LISA fields to ISU Agronomy Professor Matt Liebman’s experimental plots at ISU Marsden Farm, which diversify the corn-soybean crop rotation with red clover, alfalfa and small grains. According to Liebman’s long-term research findings, input reductions offer farmers both environmental and financial benefits. Diverse rotations improve soil quality, diminish erosion, protect nearby streams from pollution and reduce the risk of creating herbicide-resistant weeds. 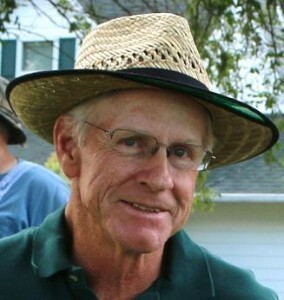 After nine years, Liebman’s test plots showed the herbicide-related freshwater toxicity associated with the diverse rotations was 200 times lower compared to the conventional system. 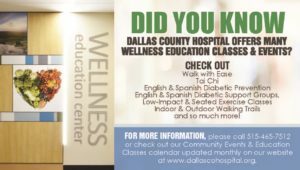 Questions followed Fleishman’s remarks, and the discussion quickly exceeded the technical knowledge of at least one audience member. 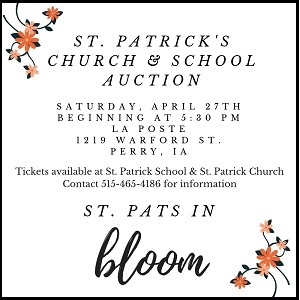 Other speakers included Iowa State University Agronomy Professor Rick Cruse, who discussed his work with the Iowa Daily Erosion Project, and Bob Hartzler, an ISU Extension and Outreach weed specialist, who offered tips and considerations for herbicides and cover crops. Discussion was very lively between the university agronomists and the well informed audience. 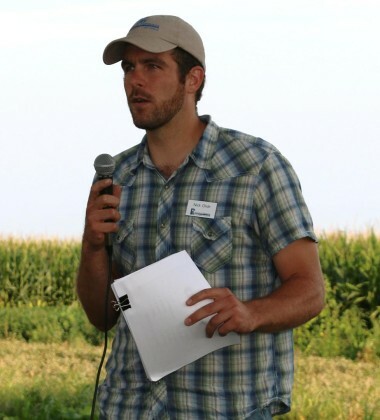 Nick Ohde, research and programming assistant with Practical Farmers of Iowa (PFI), one of the event’s sponsors, described the farmer-to-farmer programs offered through PFI and the hands-on events they provide. 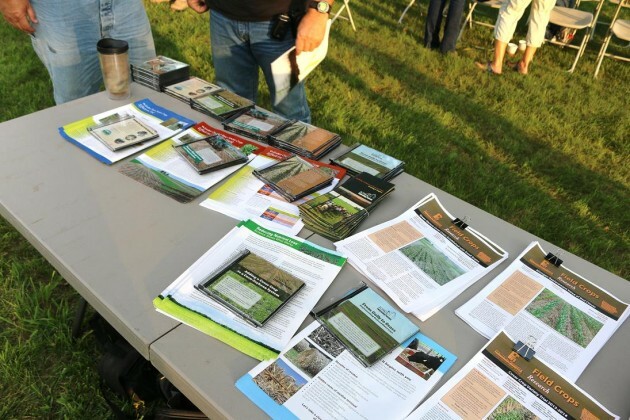 Along with PFI, Iowa Learning Farms partners with a number of agencies in organizing its event materials, including the Iowa Department of Agriculture and Land Stewardship (IDALS), the Iowa Department of Natural Resources (DNR), Iowa State University Extension and Outreach, the Leopold Center for Sustainable Agriculture at Iowa State University, the Iowa Natural Resources Conservation Service (NRCS), the Conservation Districts of Iowa, Iowa Farm Bureau and the Iowa Water Center. 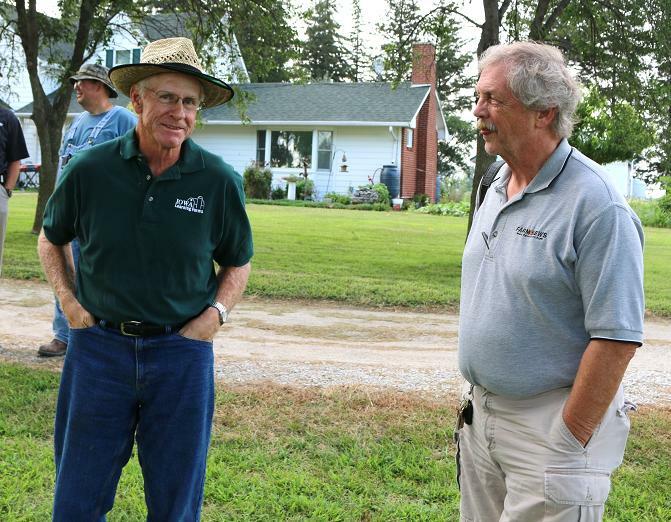 Craig Fleishman, left, welcomed many visitors Wednesday, including Larry Kershner of Fort Dodge, editor of Farm News. Liz Juchems, left, Iowa Learning Farms events coordinator, welcomed the audience to the event and outlined some of the Iowa Learning Farms many activities. Craig Fleishman of rural Minburn described his system of three-year crop rotation. The well informed audience asked interesting and challenging questions. 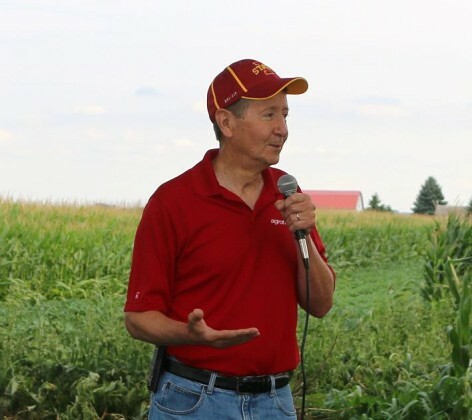 Rick Cruse, a professor in the Iowa State University agronomy department and advisor to the ISU Soil and Water Conservation Club, spoke about cover crops and his work at the Iowa Daily Erosion Center. Professor Bob Hartzler, a weed specialist in the Iowa State University agronomy department, spoke about weed diversity as a sign of soil health and about cover crops as a method of weed suppression. Nick Ohde, research and programming assistant with Practical Farmers of Iowa, described the practical benefits of PFI membership. Instructive literature was available for attendees at the ISU Iowa Learning Farms event near Minburn. 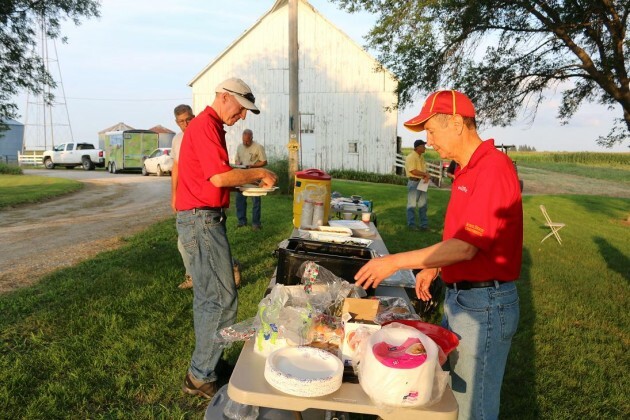 Having sung for their supper, ISU Agronomy Professors Bob Hartzler, left, and Rick Cruse shared a meal and continued the conversation.